We will celebrate the feast of St. Francis on Sunday October 7. Our message will consider the stewardship responsibilities we bear over God’s creation. What does it mean to be charged with the care of creation and our animal companions? 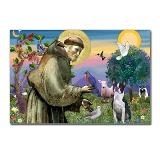 At Noon we offer a blessing of the animals in honor of St. Francis and his great devotion to all of God’s creatures. We will gather on the West side of the church, under the awnings. Our priest will pray over and bless each animal companion. Service times are 8:00am and 10:30am. The blessing of the animals liturgy will be at Noon. Show your care and gratitude for the animal companions that are significant in your life by bringing them to this service. All creatures are welcome. Tell your friends and your family about this service to the community.